The approach of winter means different things to different people — you might be eager for holiday gatherings, snowy days, and cozy sweaters. If you’re a business owner in the Northeast, though, it’s important to prepare your business for the inevitable wintry weather. Whether you have a fleet of vehicles, a physical space that needs to be maintained, or a workforce that could be affected by snow emergencies, advance preparation can mean the difference between lost profits and staying the course. Be ready for snow and ice removal. Don’t wait until the forecasters are predicting a storm to be sure that you have resources ready to perform snow removal. Your employees and customers who visit the workplace need to be able to walk inside without a slip-and-fall on ice and snow, and you want to be sure that even the interior floors are kept dry so that no one slips. That means being available with the necessary equipment or having a contractor who can clear your parking lot or sidewalk and entryway before business opens for the day (and before your first employees arrive). If you have 24-hour staff on-site, be sure that you have a plan that ensures consistent snow removal throughout the day and night when necessary. 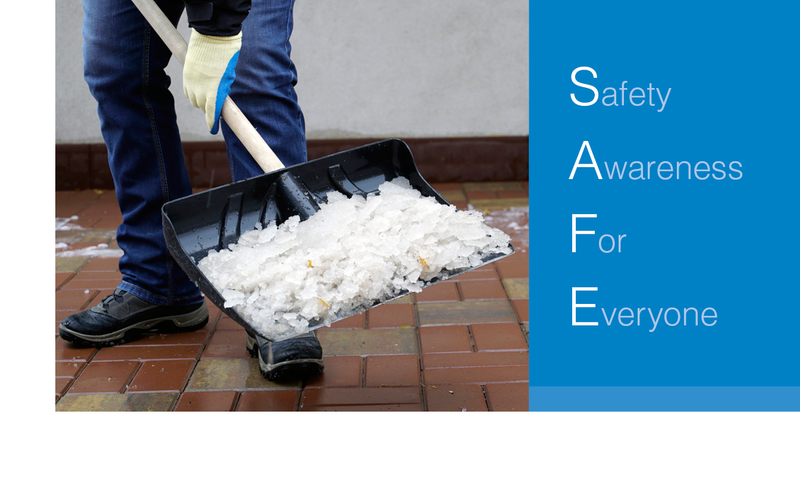 If your employees are going to be doing snow removal themselves, be aware that injuries can result from this activity. If the employee doesn’t normally do this level of rigorous physical activity, it’s important to have open communication with that person so that you are immediately aware of any issues. Any person who is clearing snow or ice should wear a reflective safety vest and ice grips on shoes or boots for traction. As well, the area must be well-lit. It’s always best to keep up with the snow as it falls so that it’s easier to handle, as opposed to managing a large amount of snow or ice at once. Maintain a supply of floor mats to keep by the door, and encourage employees and customers to wipe their feet when entering the building. If need be, have several mats available so that you can switch out when it’s very wet. You could also consider a sign by the door that reminds people to wipe excess moisture off their shoes. This will go a long way towards preventing the floors from becoming slippery. Blacktop: Black ice isn’t any more slippery than regular ice, but it is more dangerous, because it’s harder to see. If you have blacktop pavement in your parking lot, sidewalk, or walkway, be extra cautious to check for black ice. If you do spot icy patches, use a salt or melting compound. If it doesn’t melt quickly, you could put out traffic cones or caution signs so that people are aware. Handrails: Always be sure that handrails are in good condition and would be able to support a good amount of human body weight on an icy day. Lighting: You probably can’t guarantee that a walking area would be absolutely clear during a winter storm, but you can ease some liability by ensuring that at least it is well-lit, which would allow employees and customers to be able to tread carefully. Maintain tires. If roads are slippery, correctly inflated tires could reduce the risk of crashes. Remind drivers of extra precautions to take while driving in winter. For example, avoiding sudden braking, lower speeds, and turning into a skid can all be ways to prevent crashes. Have emergency provisions in every fleet vehicle. Each vehicle—truck or car—should be equipped with water, non-perishable food, warm clothes and blankets in case of breakdown or emergency. Be aware of cold-related physical stress. Fatigue, confusion, shivering, and slowed breathing are symptoms that the body is in distress from extreme cold. If you have workers outside in the cold, be sure that supervisors know to be looking out for these telltale signs of cold stress. Be alert, and share information with employees. Usually, an impending big storm is big news; your staff will be buzzing about it, and perhaps they will be planning in advance for snow day child care or travel arrangements if the roads are icy. Still, it’s important for an employer to communicate an emergency plan to employees before an emergency hits. Pay attention to warnings and alerts, and let your employees leave when they can still get home if it is feasible to do so. If there’s a possibility that the business could close in the event of a storm, let employees know ahead of time how they will be notified (text, email, etc.). Unless it’s absolutely necessary for staff to report on a snowy day, make other arrangements. There are a few reasons for this: First, you’re doing the responsible thing as an employer to keep them safe and off the roads. Second, how productive is an employee who shoveled out his own driveway, took three times the usual amount of time to commute to work, and who then is worrying all day about the commute back home? If you can allow your employees to work from home, be sure that they have what they need in order to be successful and productive. For example, does the company have laptops that some employees can take home if necessary? Or, have they been taught how to access a remote server from home computers in order to be able to work? How will you communicate with employees throughout the day? All of these things are feasible ways to keep productivity going, even when the office can’t be open, but they require advance planning. Of course, not every business can run remotely, and there are lots of situations in which you need your employees on-site in order to operate. However, if you have a customer-facing business like retail or restaurant, chances are that you will have little foot traffic during a snowstorm, anyway. Planning ahead and thinking through all of the scenarios that could come from a winter storm — and making contingency plans and training employees ahead of time — can make a big difference with respect to keeping employees safe and your business profitable through a harsh winter.